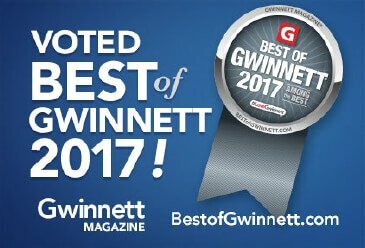 Arbor-Nomics Turf, which provides lawn, tree, and shrub care to homeowners throughout the metro Atlanta area, is pleased to announce that it has been named a Best of Gwinnett company for 2017 by Gwinnett Magazine. This is Arbor-Nomics’ second consecutive year of Best of Gwinnett recognition and comes on the heels of its eighth consecutive Angie’s List Super Service Award. How does a company make the Best of Gwinnett list? Each year the editors of Gwinnett Magazine research the community’s businesses and ask readers and consumers to cast their votes for their favorites. Voting patterns are analyzed and vetted using Better Business Bureau reports and data from various ranking sites to determine the winners in business categories such as retailers, restaurants, builders, and lawn care companies, among others. Arbor-Nomics has always valued listening to its customers. Based on customer input, the company added two new programs earlier this year: Silver Plus for lawn care and Gold Plus for lawn and ornamental tree and shrub care. The Plus programs include treatments for grassy weeds and fungal diseases in turf in addition to the fertilization and weed control that has always been standard in their lawn treatments, rounding out the company’s offerings with programs designed to fit the needs of any yard and any budget. The company continues to offer their longstanding Silver, Gold, and Platinum programs, as well as a full array of add-on services. To learn more about Arbor-Nomics’ lawn, tree, and shrub programs or its add-on services, call 770.447.6037.